You are perhaps very well aware, that I had a rhubarb theme for the recent birthday coffee, so now it is time for me to share the recipe on the cream cake with white chocolate and rhubarb with you. This cream cake is a combination of various thing such as cream cake buns, white chocolate (with inspiration from (CakeLiving) and rhubarb compote a la Sæson (issue April 2016). Start by the cake cream with white chocolate. Place the gelatine leaves in cold water for 10 minutes. Heat up the dairy whipping without let it boil. Stir in the chopped white chocolate into the hot cream, stir until the chocolate is melted. Pour the cream mass into a bowl, where cling film is placed directly on the surface of the cream to avoid formation of a skin layer. Place the white chocolate cream in the refrigerator for minimum 3-4 hours or night over. Meanwhile make the rhubarb compote. Cook up the rhubarb pieces, sugar,vanilla corn and pods in a medium cooking pot. Cook until the rhubarb pieces are soft (approx. 10 minutes). After cooking remove the vanilla pods. Remove 1-2 tablespoons of the rhubarb syrup and store for later use in the glazing of the cake. Cool down the rhubarb compote. 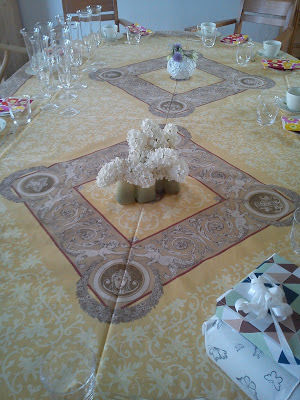 After 3-4 hours it is time to put the cream cake together. Whip the white chocolate cream until its creamy and airy. Place the first cream cake bun on a cake tray. Spread ½ of the white chocolate cream on top of the first cream cake bun. Spread ½ of the rhubarb compote on top of the white chocolate cream. Place the second cream cake bun on top of the rhubarb compote. Spread the rest of the white chocolate cream on top of the second cream cake bun. Spread the rest of the rhubarb compote on top of the white chocolate cream. 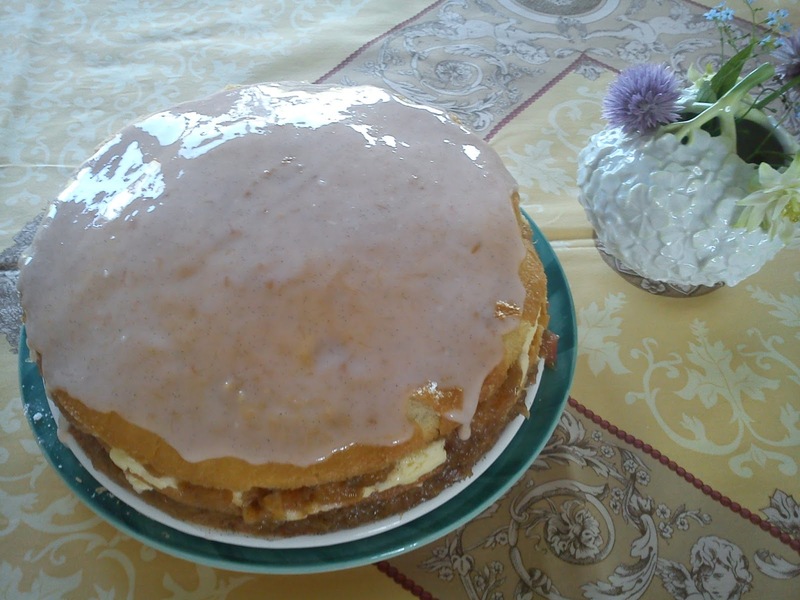 Place the third cream cake bun on top of the rhubarb compote. Place the cream cake for 3-4 hours in the refrigerator. Prior to serving the cream cake making a glazing for the top cream cake bun out of the removed rhubarb syrup and icing sugar. Sometime ago I found this recipe on buns with rhubarb compote on a blog. 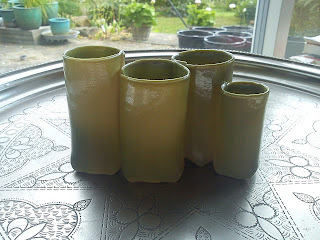 I have been storing this recipe for, and suddenly they fitted perfect into my rhubarb theme for the recent birthday coffee. Inside of making a fast raising of the bun dough it fitted better into my time frame to make this bun dough using cold raising letting the dough stand night over, actually 12-16 hours. Therefore I reduced the yeast amount significantly from 50 g fresh yeast to 10 g yeast. Do the dough raising according to what fits your calender the best. 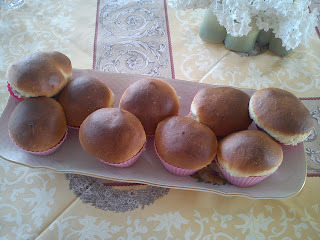 The way that these buns are made reminds me very much about the Shrovetide buns, which we Danes eat in February. Start by making the rhubab compote. Place the rhubarb pieces in a small cooking pot. 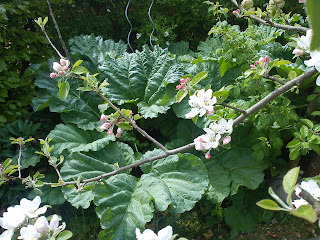 Heat up the rhubarb, until they release their water. When add in the vailla pod, vanilla corn and sugar. Let the rhubarb compote boil gentle for 10 minutes, until the rhubarb pieces are soft. Remove the rhubarb compote from the heat, stir in the butter and grated marzipan. Stir until the butter is melted. Store the rhubarb compote cold for later use. Blend by the butter and wheat flour together using your hand until the consistency is grainy. Stir the fresh yeast into the milk. Add the egg, salt and syrup into the milk-yeast liquid. Add this liquid phase into the flour mass, knead the dough together using a stand-alone mixer, mixing on speed 2-3 for 10 minutes. Let the dough raise cold for 10-16 hours. 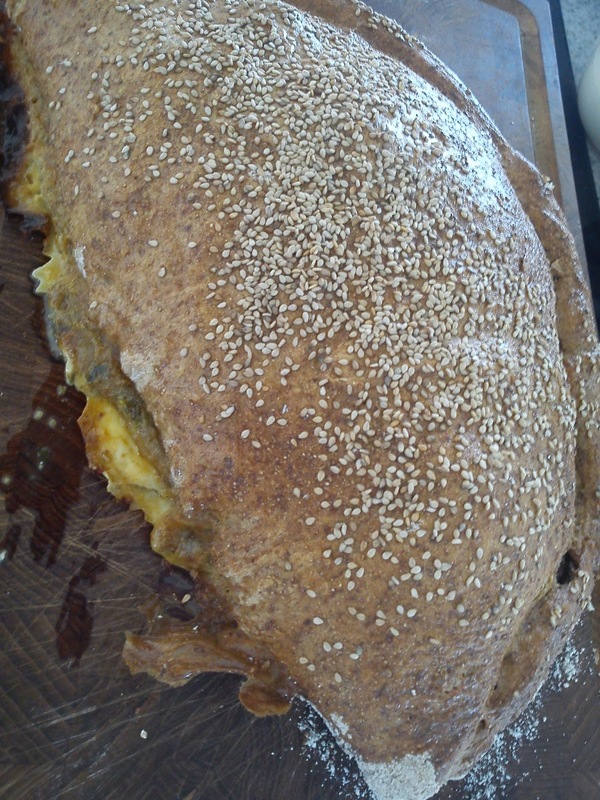 Divide the bun dough into a weight of 75 g each. Flatten the bun dough into a square. 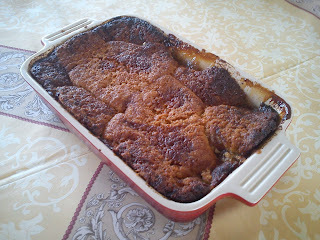 Place a big teaspoon full of rhubarb compote on top of the dough.Cover the rhubarb compote with dough. Place the bun with the closing side at the bottom in a muffin form. Heat up the oven to 220'C. Let the buns raise warm for 30-45 minutes. Bake the buns at 220'C for 10-15 minutes. Cold down the buns prior to serving. 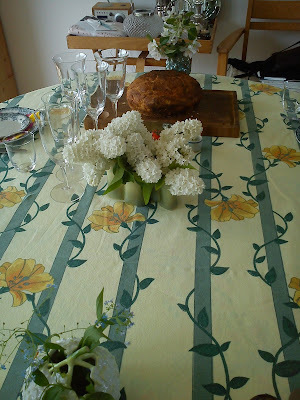 As the sweet finishing touch for the birthday lunch I served a cheese cake with white chocolate and rhubarb. I have used a recipe from the magazine "Isabella's issue 03/2015" as starting point for this cheese cake. If you remove the water part of the rhubarb compote, there should be no need for addition of pectin or starch. The rhubarb is giving off plenty of water in connection with the cooking. Mix the melted butter and crushed Digestive biscuit together in a mixing bowl. Press this butter-biscuit mix together as a bottom layer of a spring form, 20-22 cm in diameter. Cook up the water, sugar and rhubarb pieces in a smaller cooking pot. Bring the rhubarb compote to the boil. Stir in the pectin in to the rhubarb compote. Cook until the rhubarb pieces are soft. 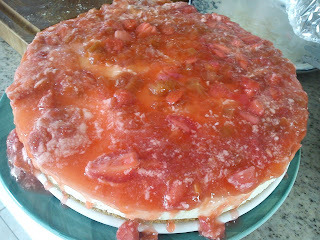 Remove the rhubarb compote from the heat, mix in the strawberry pieces. Cool down this rhubarb compote. Place the gelatine leaves in a bowl with cold water for minimum 10 minutes. 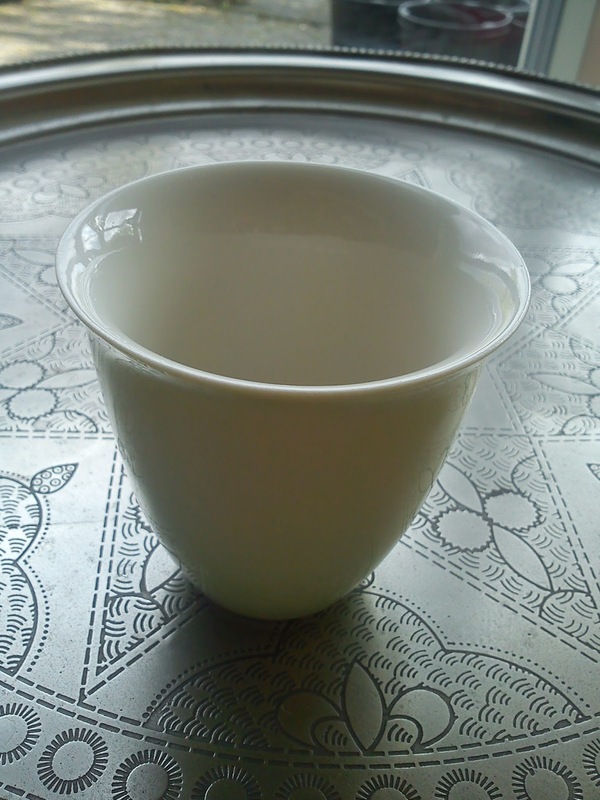 Melt the white chocolate over a water bath. Whip the sugar and eggs into a foamy mass. Whip in the mascarpone into the sugar-egg mass. Melt the gelatine leaves over a water bath. Stir the melted gelatine into the lime juice. Whip the dairy whipping cream in a stiff foam. Add the melted white chocolate into the mascarpone-egg-sugar mix. Add the lime juice-gelatin mix, while whipping. Gentle stir the whipped cream. Pour the cheese cake mix into the spring form on top of the biscuit bottom layer. Pour the rhubarb-strawberry compote on top of the cheese cake base. Store the cheesecake cold in the refrigerator cold for minimum 3 hours or night over. Remove the spring form prior to serving. 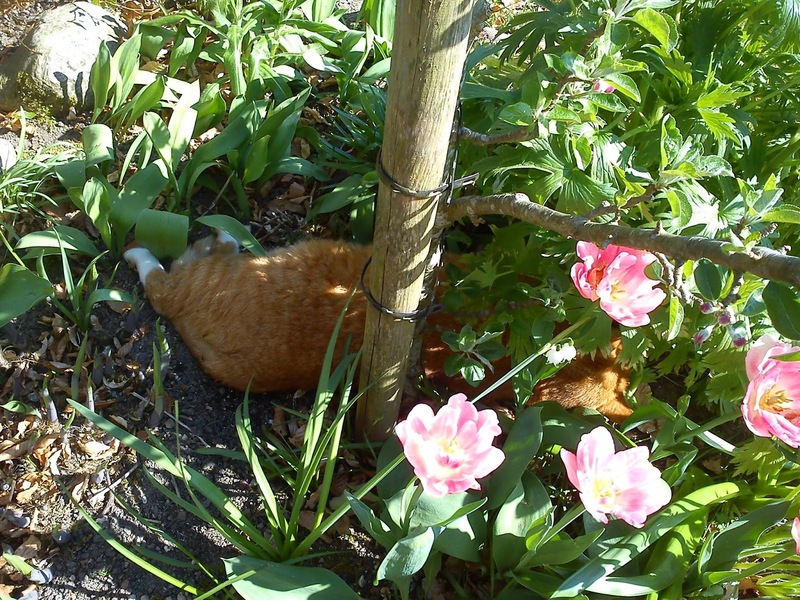 I had selected rhubarb as theme for this birthday coffee, as my rhubarbs are doing the best to take over mu little garden, so I am doing my best to control them ! So instead of the usual bun served with butter and jam, I served a buns with rhubarb compote as filling. Continuing with the rhubarb the guests enjoy with rhubarb cake, where I actually had to make all the components of the cake twice !!!! After I had add all the three components together in the baking tray I decided to eat some of almonds, while I was chopping some almonds as the final touch. The almonds, which I had been using tasted really foul !!! Luckily I had some another portion of almonds, so I could remake all the cake components. On top of the cake "disaster" I also got home 1 hour later than expected, as my car battery was completely flat, so it had to be changed. So all in all it was a bit stressful ! The classic element for a birthday coffee in form of the cream cake, which time with a filling of cream part with white chocolate and fruit part of rhubarb compote and sugar glazing made from rhubarb cordial and icing sugar. 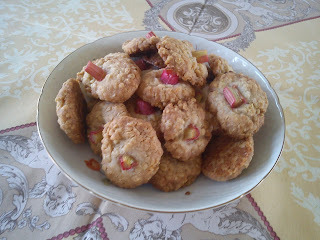 To fill the last hole in the stomachs of my guests I served some oat cookies with a small rhubarb piece as decoration. Great tasting and very easy to prepare snack, which you could serve as either a small starter or as a snack together with drinks. I used ready-to-use puff pastry dough, as I had some many more thing to prepare for my birthday lunch. So do, what it most easy for you making your own puff pastry dough or using ready-to-use dough. As nuts I used pecan nuts as I could not locate any walnuts in my kitchen, while making this snack. So again use pecan, walnuts, hazel nuts, pine kernels and what ever you have in your kitchen cupboards. Heat up the fan oven to 190'C. Use a large tumbler glass to cut 7 circles of the puff pastry dough. Cover each hole in a muffin form with this circle of puff pastry dough. Place a slice of fresh goat cheese into each muffin form covered with puff pastry dough. Sprinkle each slice of goat cheese with 2 needles of fresh rosemary. Place the honey (1/4 teaspoon of honey) on top of the goat cheese. Finally added the chopped pecan nuts as topping of each small pie serving. 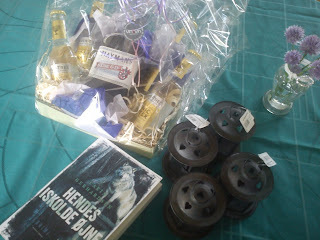 I was celebrating my birthday last Sunday with a lunch for my good girl friends. As table decoration I used a selection of my many green vases incl my latest addition from the Whit market at Trapholt.The flower input for the vases forget-me-not going at the boarders of one neighbour´s garden, while the lilac has picked in another neighbour's garden, while she was not at home ! 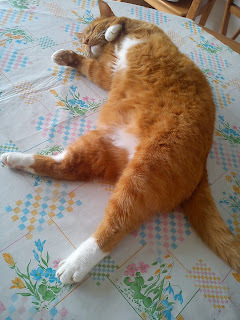 As usual the the local garden lion needed to rest on the dining table just before, I laid the table :-) I did not serve the cat for the guests ! I will be sharing the various recipe from this birthday lunch in the very near future. 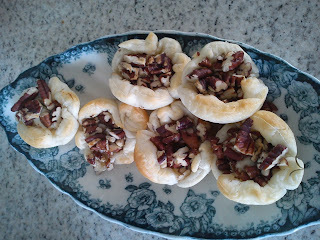 As starters we had first some small puff pastry pies with goat cheese, honey, rosemary and chopped pecan nuts. 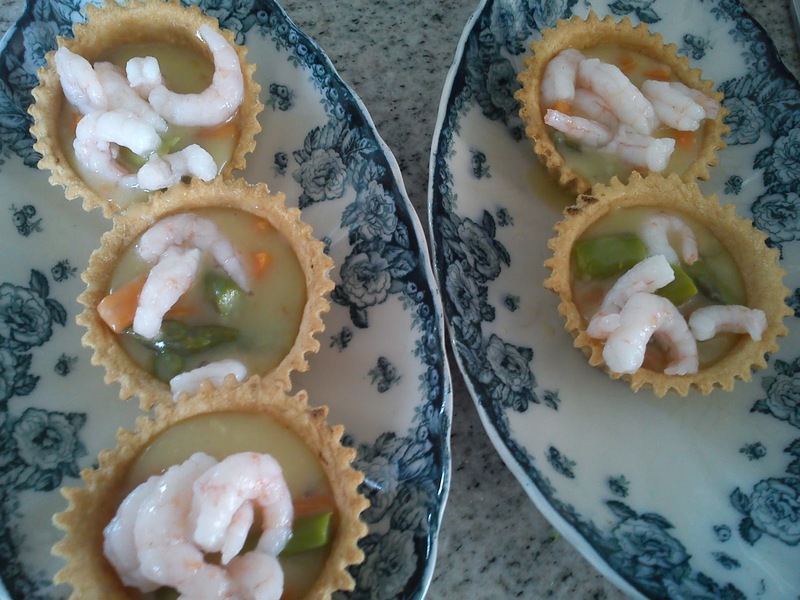 The second starter was patty shells with a filling of carrots, asparagus and scrimps. As the more filling part of the lunch I served pirog with vegetable filling, tortillas with chicken, rhubarb compote, boiled potatoes, steamed asparagus, fresh cucumber and radish and cream-lemon dressing. 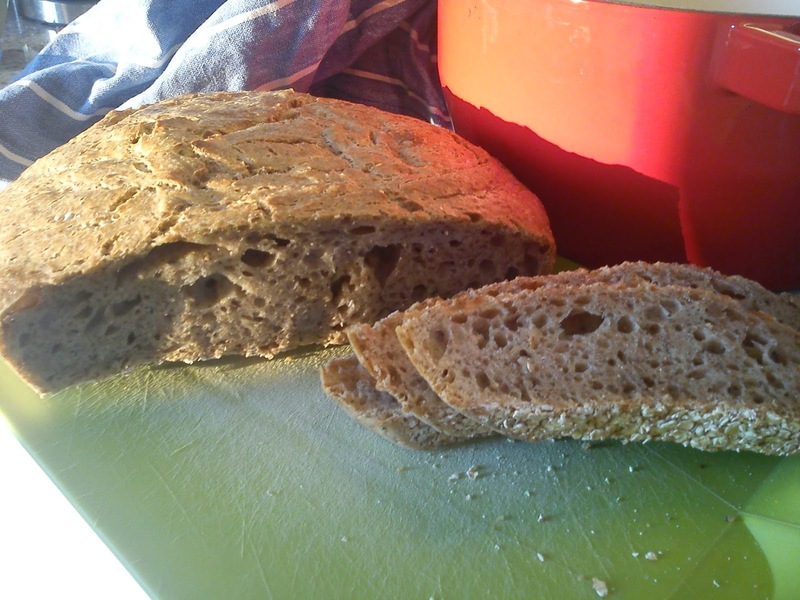 The bread part was the great tasting Manitoba bread with maple syrup. The sweet for the afternoon coffee was a cheese cake with white chocolate and rhubarb fitting perfect in the theme of May. May is a busy birthday month in the family. First my mother celebrates her birthday and 3 weeks later on it is time for my own birthday. Therefore plenty of guests find their way to my home either for dinner or coffee. 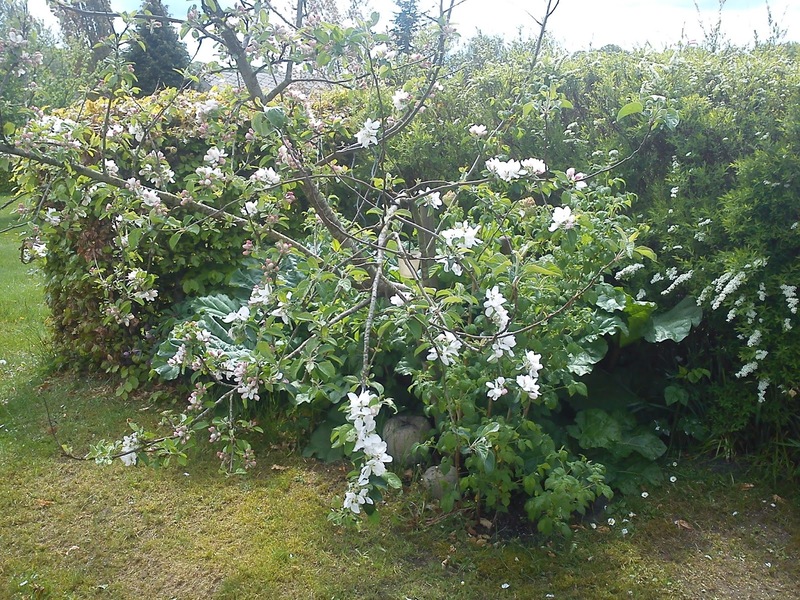 And this year I have selected a theme for my birthday coffee, as the rhubarbs more or less have concurred my tiny kitchen garden area in my little park. So all the thing, which I will for the upcoming birthday coffee with contain rhubarb, so I hope my guests are rhubarb fans like me !!! 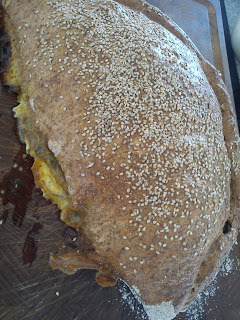 In order to celebrate the arrival of Spring I decided to have a cooking pot bread with a twist of ramson. 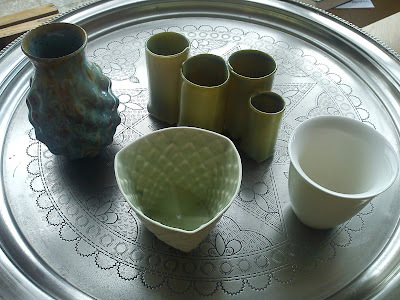 I found less ramson flavour, when I was expected as starting point. So perhaps it would be better just to serve a cooking pot bread with ramson oil and ramson salt ? Stir yeast, sour dough and water together in a big mixing bowl together with ramson salt, ramson oil and sugar. Afterwards add the two flours and stir very well with a cooking spoon. Rise the dough to rise at room temperature overnight - minimum 12 hours and up to 24 hours. Heat up the cast iron cooking pot (2 l) incl. lid on a rack in the lower part of the oven at 250°C (fan oven) for ½ hour. Place the dough in the hot cast iron cooking pot. Put the lid back on. Place the cooking pot in the lower part of the oven, let it bake at 250°C for 25 minutes. Let the bread cool down in the cooking pot, before you try to remove the bread. The Christmas fair at Trapholt has become a mot-do-thing for me, however, it is very first time for me, that I have been a guest at the similar pinsemarked Trapholt. At this market you can find some great craft designers of very high quality. As usual my advise to you is to arrive from the very beginng, as this means you can get parking spots more or less next door to the museum. Besides from getting a good parking spot, you can also get a good look around the various arts and craft booths, before the fair area becomes over-crowed. The entrance is free to both the fair as well as the museum, so you actually save 75 DKK, which is the normal entrance to the museum !!! The fair will also be open again tomorrow Whit Monday. So what could I "not live without" this time ? 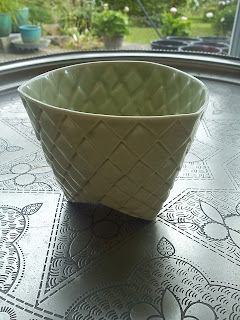 Another china bowl where the pattern is inspired by pines by Gitte Jensen. 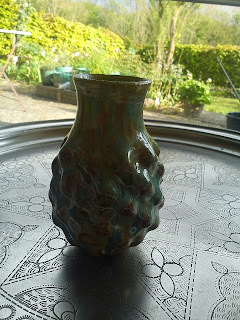 Another green vase by Janni Godtliebsen, where a new colour of glazing had been testing. Otherwise her vases are in white or white with black pattern.